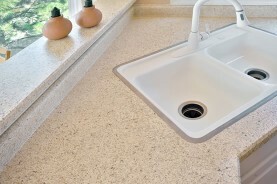 Before you head out to the local hardware store to buy one of many DIY countertop paint kits currently on the market, you should know that there are a couple of downsides to this refinishing option. For one, if your bathroom or kitchen counter tops are marred by gouges, burn marks or missing laminate, a paint kit is not going to do much for them. While these kits are also marketed as an easy and hassle-free way to transform the bathroom and kitchen surfaces in your home, the process can be time consuming and the chemicals involved require protective gear. If this is something you’re considering, you’ll want to be prepared to put in a lot of elbow grease and time. You should also be prepared to work quickly and carefully. As many people with surface restoration experience will tell you, the margin of error during this process is small. An extra set of hands is recommended because the time frames for applying the coats are narrow. Depending on how much counter top space you’re working with, along with the quality of the kit materials, you may spend hundreds of dollars by the time you’ve completed the project. If your counter tops don’t turn out the way you hoped or expected (and believe us, that’s not uncommon), then you’ve wasted your time and money. Other projects look nice, but don’t last. 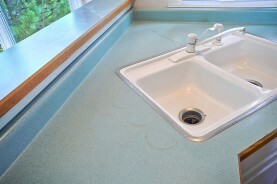 We’ve found that many of these painted counter tops are prone to scratches and aren’t waterproof. In fact, we’ve fixed many DIY countertop painting projects gone wrong. Why not save yourself from frustration? Let us do it right the first time. We’ll clean and smooth the surface, we’ll fill the chips and cracks, and then we’ll use advanced, high-tech acrylic coatings, and a proprietary bonding agent to create a durable, beautiful finish. Want more info? Give us a call at 1-888-271-7690. 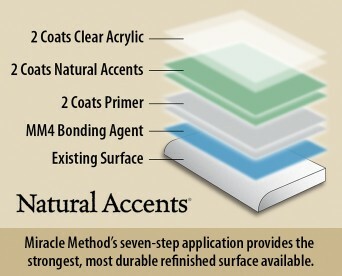 Miracle Method countertop refinishing gives you the beautiful, long-lasting finish you deserve!